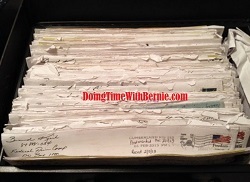 DoingTimeWithBernie.com: Corrupt NYPD Commissioner, Eight-Time Convicted Felon on Probation, Tax Cheat and Liar Bernard Kerik calls out an NYPD Captain Forster...Yes, That Happened! Corrupt NYPD Commissioner, Eight-Time Convicted Felon on Probation, Tax Cheat and Liar Bernard Kerik calls out an NYPD Captain Forster...Yes, That Happened! Corrupt NYPD Commissioner, Eight-Time Convicted Felon on Probation, Tax Cheat and Liar Bernard Kerik calls out an NYPD Captain...Yes, That Happened! Felon Kerik can be whatever he wants to be on the internet, specifically on his Facebook https://www.facebook.com/bernard.kerik.5, where Kerik has the brass ones to call out NYPD Captain Scott Forster for "dereliction of duty" without so much as any facts or details released to the public. Kerik shares an article from his cronies at Fox5News "NYPD Captain Left Work After 2 Cops were Shot". Kerik quips, "Unless there is some extra ordinary reason why this captain did what he did, this is an inexcusable dereliction of duty. I just don't get it!" Yup, Bern, you never "get it". That's why you went to prison. Yes, this judgement declared by a corrupt cop and libel-proof felon who shamed the NYPD and reportedly owes the country he cheated over $180,000 criminal restitution (USA v. Kerik 7:2007-cr-01027, S.D.N.Y) as well as a resulting IRS tax lien of over $360,000.00!! Maybe Kerik should STFU, use the Facebook posting time to get a j-o-b to pay his TOTAL debt to society before pointing the judgement fingers at anyone else!